RRB Ahmedabad Group D Recruitment 2018-2019 Notification is available in this article. So, all the candidates are notified that 6087 Vacancies are available. So, all the interested contenders can check and apply for Railway Vacancy Group D 2018-2019. Moreover, you can also visit the official web portal too that is rrbahmedabad.gov.in to get the latest information. Therefore, all the aspirants are advised to check the entire details which are available in this article. To help the people, we also have, given depth information through this article. So, without late, just refer this post and enjoy the latest stuff. And also, one more instruction to the candidates is you have to apply before 31st March 2018. We all know that the closing date is approaching fast. Hence, verify the Eligibility Criteria which we have arranged in the below sections. The authority of Railway Recruitment Board Ahmedabad asked the candidates to fill 6087 Grade IV Vacancies 2018-2019. Therefore, those who are interested and having all the eligibilities criteria can verify the details and apply. We are very confident that this is a massive opportunity for all the job seekers. Many of the contenders are eagerly waiting to check all the eligibilities. But no one can’t find the proper details about RRB Ahmedabad Group D Vacancies 2018-2019. So, to avoid that problem, we have bundled a lot of stuff in this article. Therefore, you can check the Education Qualification, Age, Pay Scale, Selection Procedure, Application Fee Details and much more details are available in this article. By checking the above table, all the contenders can easily know about RRB Ahmedabad Group D Recruitment 2018-2019 details. And till now many of the eligible contenders had submitted their Online Application Forms and remaining are in a dilemma to check the details. So, that we have created this article and shared the entire information in a single place. Moreover, all the contenders can easily gain the complete 6087 rrbahmedabad.gov.in Grade IV Vacancies 2018-2019 by checking the above table. And after completion of an application process, you have to start your preparation immediately. So, all the applied aspirants must and should participate in the written exam in April and May 2018. RRB Ahmedabad Group D Recruitment 2018-2019 Notification might be very helpful for the candidates those who are interested in Railway Jobs. Coming to the education qualification, all the aspirants must have 10th class or ITI or its equivalent from any recognized university or board is the perfect qualification to apply for 6087 Grade IV Vacancies 2018-2019. And checking the Age Details are also mandatory for the applicants. Moreover, the officials stated that the applicant’s minimum age should be 18 years and maximum age is 31 years. And also, one more instruction to the candidates is the Age Relaxation is also applicable according to the government norms. And, the Railway Recruitment Board (RRB) is happily stated that all the selected people can get Rs. 18, 000/- Per Month. Scroll down and check more information regarding RRB Ahmedabad Group D Recruitment 2018-2019 for 6087 Grade IV Vacancies. And also, you have to pay an application fee too. Candidates need to pay Rs. 500/-. Likewise, other category people (SC/ ST/ Ex-Serviceman/ PWD/ Female etc) should pay Rs. 250/-. So, the selection procedure purely depends upon Written Test (Computer Based Test), Physical Efficiency Test (PET), Document Verification and Personal Interview. Interested people can take a look and find out the complete details and apply for RRB Ahmedabad Group D Recruitment 2018-2019 through Online mode before 31st March 2018. Therefore, to get the complete details just go through the below sections. Moreover, we have also tried our level best and collected Official notification and attached in the below. Therefore, you can download the RRB Ahmedabad Group D Recruitment 2018-2019 Advertisement from the below section at free of cost. Selected people can receive Rs. 18, 000/- Per Month. In this section, we have given a post wise vacancy details in a tabular form. So, contenders can check the below table and gain about the posts. General Candidates need to pay Rs. 500/-. Other category candidates like SC/ ST/ Ex-Serviceman/ PWD/ Female etc need to pay Rs. 250/-. Age relaxation is applicable for all category candidates. 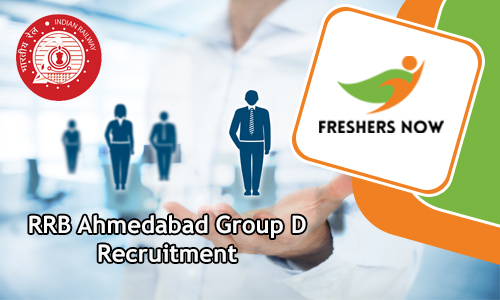 So, click on the above link and download the RRB Ahmedabad Group D Recruitment 2018-2019. Therefore, we hope all the people got enough information regarding 6087 Grade IV Vacancies 2018-2019 by checking the current article. To get much more recruitments across India just visit our website Freshers Now regularly and get the genuine information.